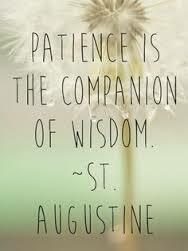 The fine art of patience, it isn’t an easy one for us humans to practice. Often when a life-changing decision has to be made, it can take us weeks, even months, to decide what to do before we can put our minds at rest and get on with it. Perhaps you have decided and without a doubt settled into the fact that you want to sell your house, so you call the realtor. The Real Estate professional draws up the necessary papers and the big FOR SALE sign goes out at the end of your driveway. You feel almost certain that within a matter of days you will have a buyer and the life you have been dreaming about will begin to fall into place. Have you noticed that once you make up your mind, once you have agonized over what to do and come to a conclusion, patience takes on a whole different meaning? Who ever said “Life is about the journey and not the destination”, well sometimes we find this out not in the way we think we should. Soul growth comes from facing our fears. Our spiritual growth begins when we find ourselves in the midst of a life-rattling decision. Putting our plans into motion and actively becoming a part of the process is how we elevate our Soul’s mission. Humans don’t like to shift or remodel, not internally anyway. There is stability when everything stays the same for us, even at the price of our happiness, we put up with whatever it is. It seems easier and more comfortable to turn a blind ear to the quiet whispers inside of us. As long as we don’t have to face what is wrestling with our Ego, all is well. If a day comes when we are brave enough to want to make a viable change towards a dream or desire, it is because we can’t ignore the calling of our inner voice any longer. But what if the house doesn’t sell in just a few days? If the dream of a SOLD sticker begins to fade away, do you begin to question your decision? Absolutely not—very often something that took months to decide will require a little more consideration, from a Soul perspective. The Universe will gift us extra time so we can really settle into where all of the change might take us. If there are a few kinks to iron out it doesn’t mean that we lose sight of the dream. Embrace patience like you never have before and hold on tight to the excitement you felt when you made your decision in the first place. Sometimes we have to let go of the rains and let the Universe lead the way. Give your patience over to your ability to trust the process that is taking place.